Use the SalesforceIQ API to connect with other tools that you use to manage your critical business workflows. 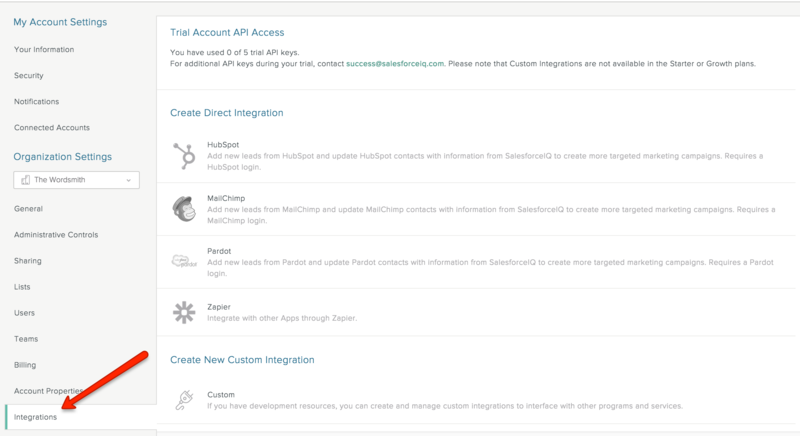 Note: API access is available in some SalesforceIQ plans only. Contact us about upgrading your account to a supported plan. Our documentation includes a section titled “Introduction and Basics" that provides code examples for standard use cases that customers have used successfully. Please see our API Documentation here. To get your team up and running, you must be your Organization's admin. Learn about how to check if you're the Organization admin here. Click at the top of the screen, and then select Settings. 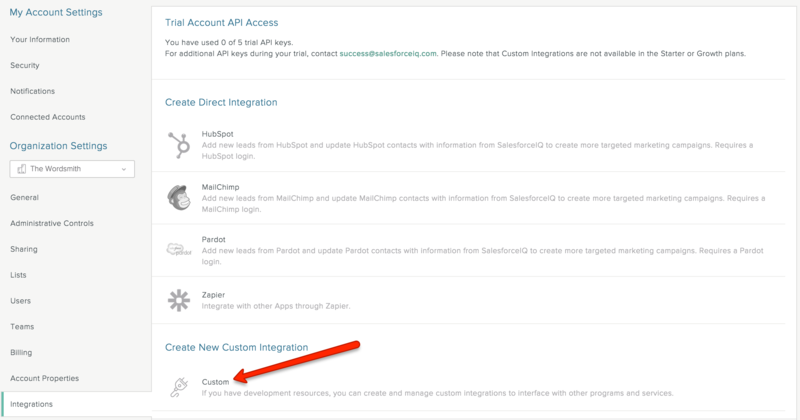 Click the integration type you want (Custom in this example). Enter a name for your API key. SalesforceIQ uses this name to tell users where the information they see is coming from. A public key and a secret key are displayed. Note: Don't lose the secret key. It won't be shown again. Provide both keys to your developer and point him/her to our API documentation. Use one key per source of data—for example, web form, marketing system, etc. If you need more than three keys, please submit a case to our Support team on the Contact Us page. Be sure to include information on your intended use case(s). Selecting Reset Secret breaks any existing integrations that use that key. Use this option with caution.